for hiking and exploring small waterfront settlements . . ."
Sounds like our kind of place, eh? 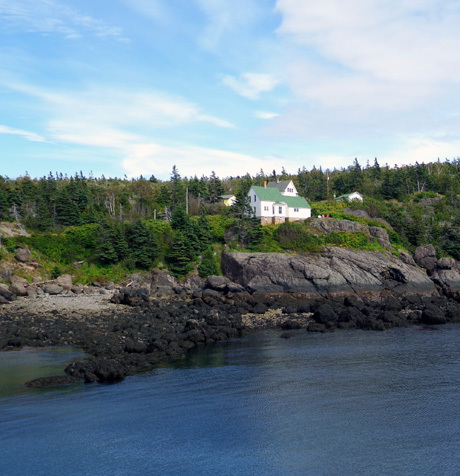 Too bad I didn't find that web page when we were initially researching the western side of Nova Scotia's mainland and made reservations at Whale Cove Campground -- or we wouldn't have been so surprised to discover where it was actually located! 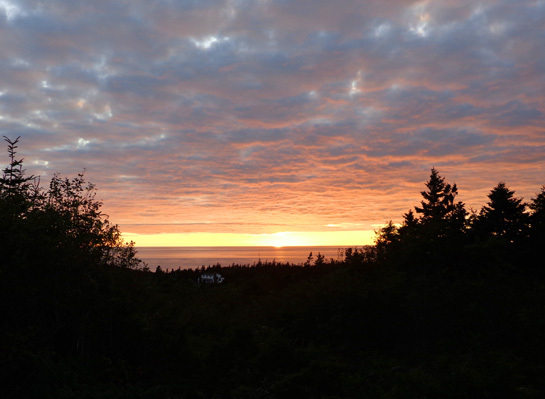 We were initially dismayed to realize that our campground was 25 miles south of Digby, not nearly as close to town as we thought. We made our reservation in some haste, without doing adequate research. 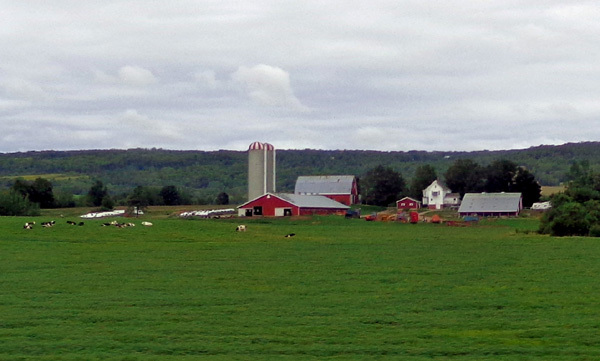 I thought it'd be nice to spend a couple days traveling around the bucolic Annapolis Valley region just north of Digby, a fertile farming area known for its wine and produce. I had no clue where or what "Digby Neck" really is. Ironically, it turned out to be the best "goof" we've made in our travel plans this summer! 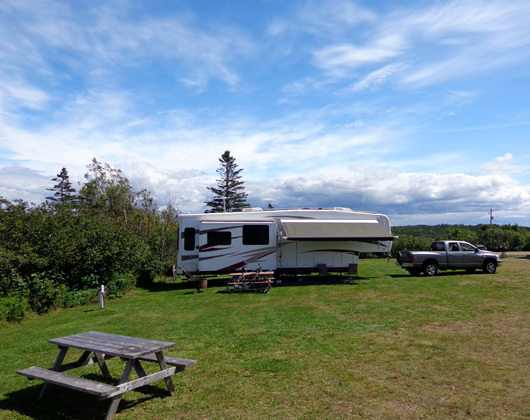 We loved the campground, its proprietors and location, the two nearby islands at the end of Digby Neck, and the opportunity we had for a great whale-watching cruise. We had warm, sunny weather the three nights and two full days we were here. We made the most of it, cramming in lots of sight-seeing and other activities and having some time to just relax. 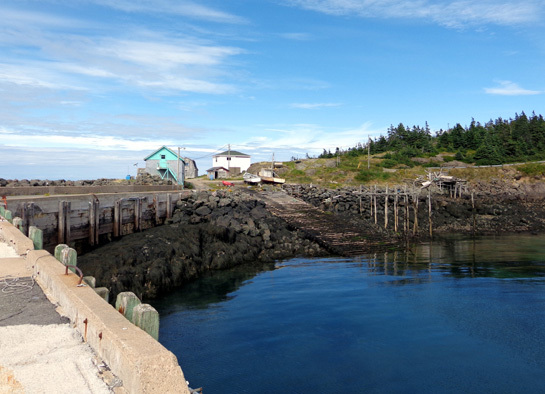 We had a choice of several routes to get us from Point A (Hammonds Plains, north of Halifax) to Point B (Whale Cove, south of Digby) today. We chose the one that appeared fastest and best for hauling a 36-foot 5th-wheel -- primarily on NS 101. 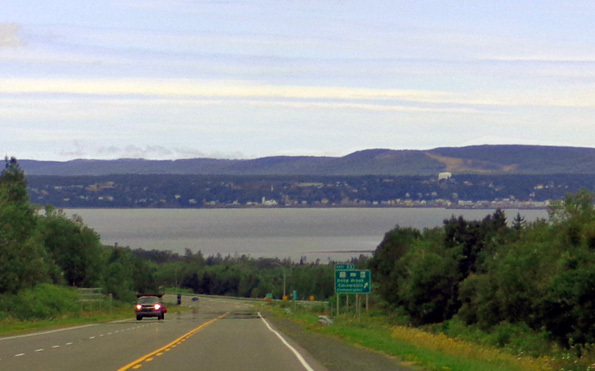 Digby Neck is that long, narrow peninsula on the left. 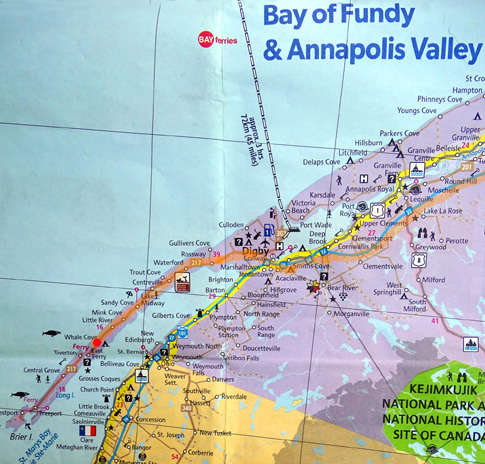 The huge Bay of Fundy is to the west and St. Mary's Bay is to the east, separating the "neck" from the mainland of Nova Scotia. 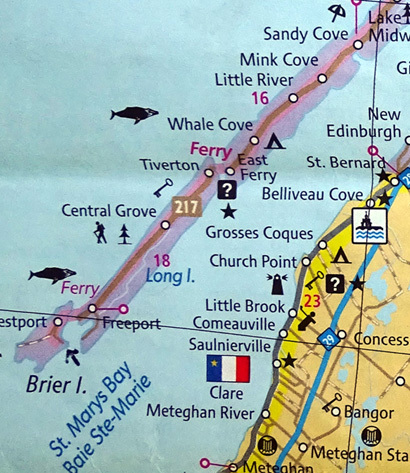 Our destination, Whale Cove, is marked with a red circle. 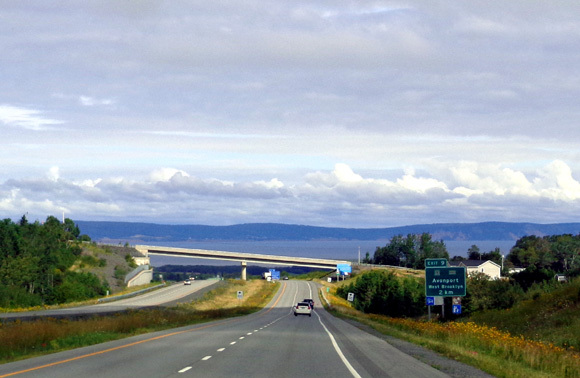 NS 101 is a typical Maritimes "freeway" that has limited access but only one lane each direction in some places, with passing lanes up hills. This route was hillier than we expected so there were lots of passing lanes. 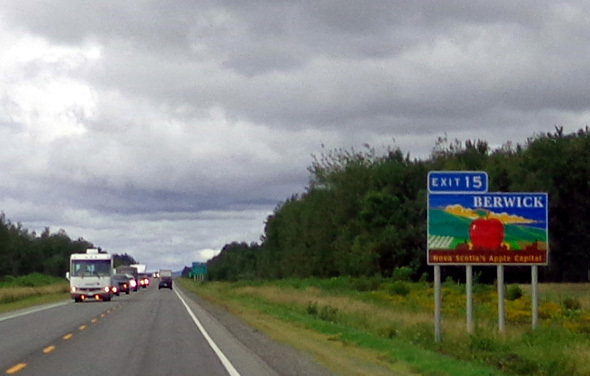 We didn't see as many RVs on this route as we have in other parts of the Maritimes. Colorful sign for Berwick, "Nova Scotia's Apple Capital"
+ the Hopewell Rocks area get the highest variance of tides in the bay at up to 52 feet every six hours! 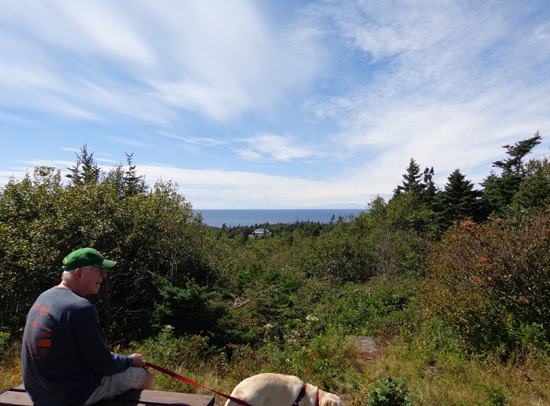 The mostly-forested route was pleasant but we did get some views of Minas Basin, at the far NE end of Fundy Bay, and the large Annapolis River Basin north of Digby. 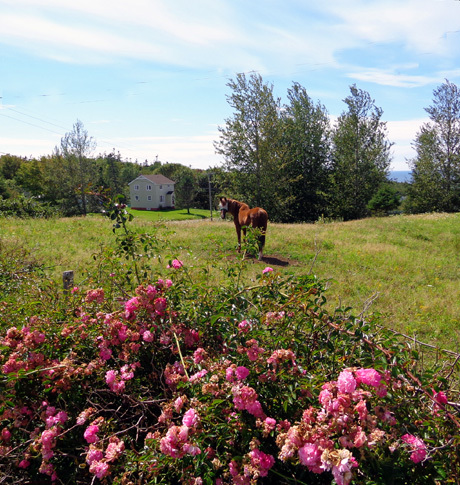 We missed seeing most the beautiful farms, orchards, and vineyards in the Annapolis Valley on Hwy. 101. Apparently those are better seen on Rt. 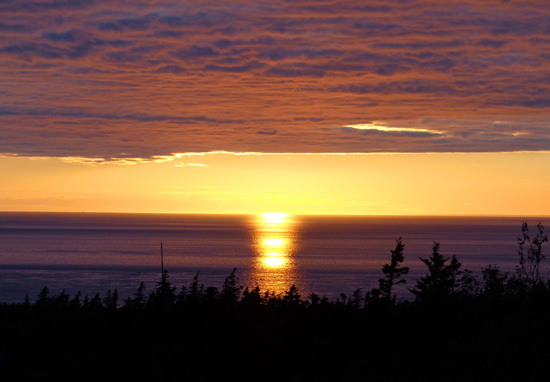 1, which we plan to take when we head north to Prince Edward Island. 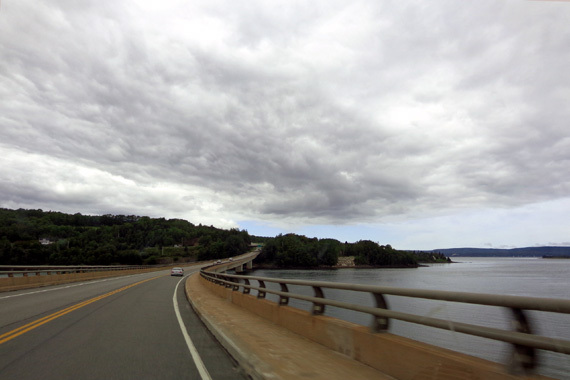 Our GPS also directed us around the town of Digby so we drove there another day to see it. 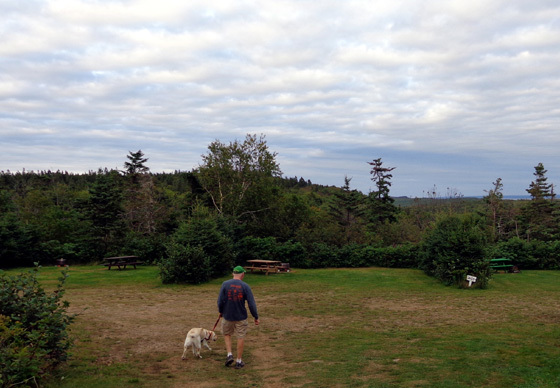 Our initial disappointment about not being close to the town of Digby was short-lived. 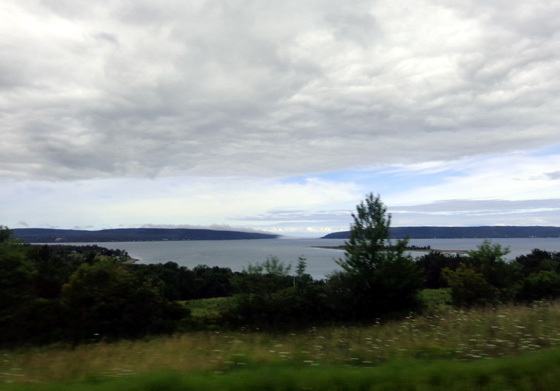 After getting to the campground and learning more about the two islands just south of us, we're glad to be here. 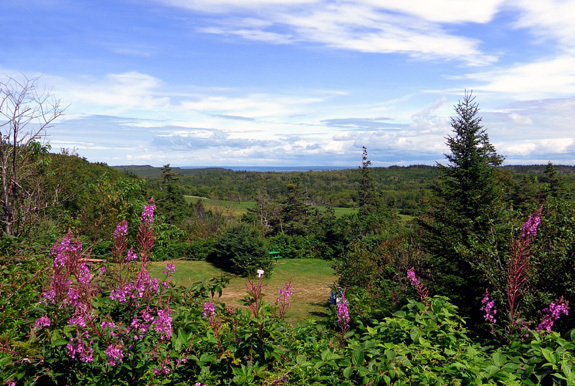 The campground is on the ridge above the Bay of Fundy and St. Mary's Bay, with views of both from nearby overlooks that are just a couple hundred feet from our site. That is so cool! We can see the sun rise on one side and set on the other. 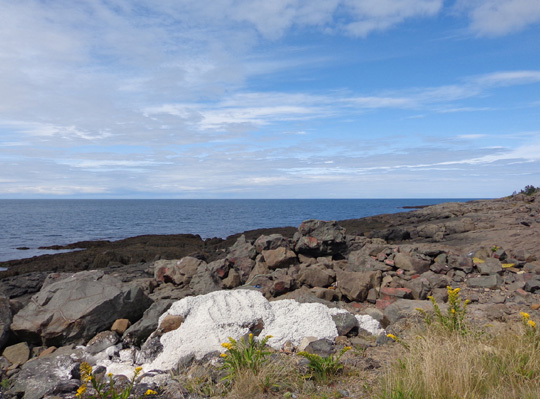 When we arrived around lunchtime the campground was nearly empty except for a group of about 25 college biology students and teachers who were midway through five days of studying the local marine life, including whales, porpoises, seals, lots of birds, etc. By evening most of the RV and tent sites were taken. Jim and Casey walk toward one of the tent areas before they were occupied. 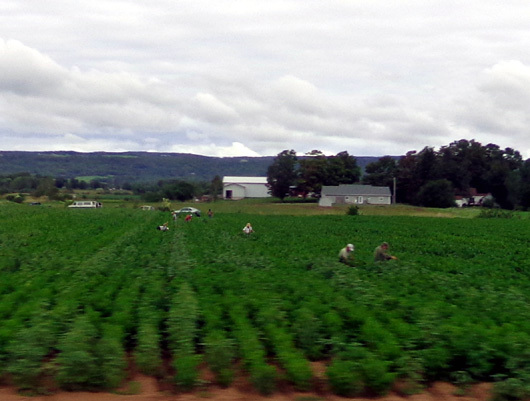 We're glad we got here when we did so we could get into our site in a field more easily. There were motorhomes on either side of us the first two nights but we all had plenty of room. 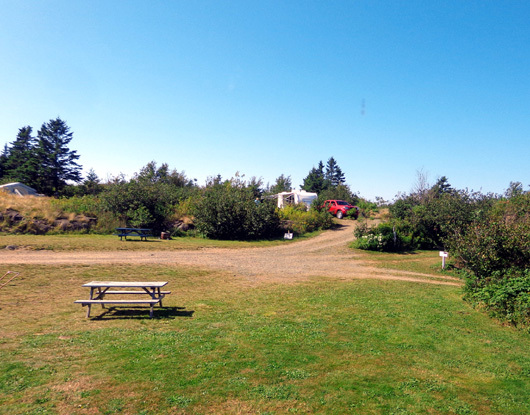 The downsides to Whale Cove Campground are no sewers (just a dump station), our site has only 20-amp electricity (some have 30), and the cost is relatively high ($108 CA with tax for three nights). I can't get online with the campground WiFi on my laptop inside the camper but Jim can. There are showers/toilets and a laundry room for those who need them. 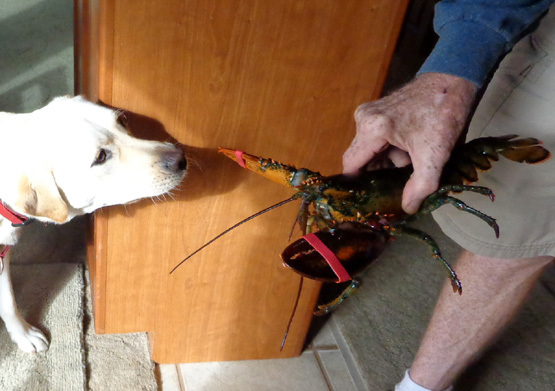 The owner of the campground is also a lobster fisherman. He fishes in the spring and summer until July 31, then again in October to December. 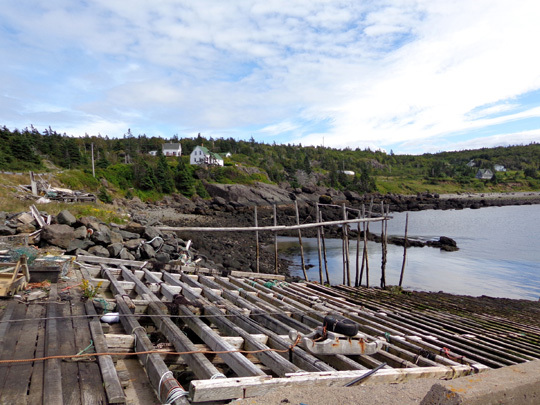 He has kept alive a bunch of lobsters to sell to his guests and locals for the lowest price we've seen in the Maritimes -- only $7 CA per pound for live ones. He can keep the price low because there aren't any middlemen. 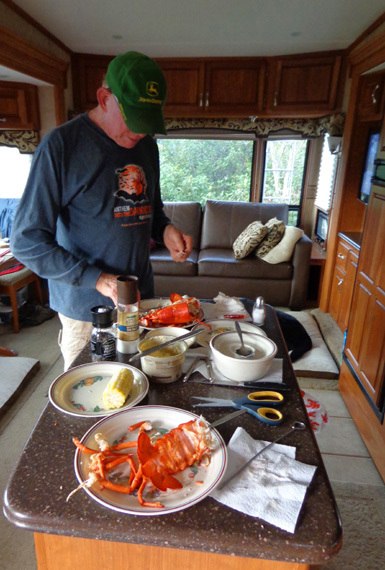 With his and the staff's encouragement and assistance, we purchased two 1.5 pound lobsters for dinner the first night and cooked 'em in our camper. They loaned us a large pot to steam the critters and the proper tools to eat them. They even gave us cute lobster bibs! 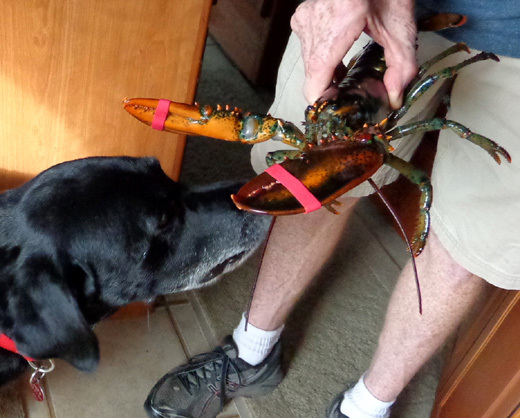 Jim finishes off his lobster. Our lobsters were mighty good -- a lot of work involved with getting all the meat out of the legs, claws, tail, and body, but an "experience" we haven't had for a long while. 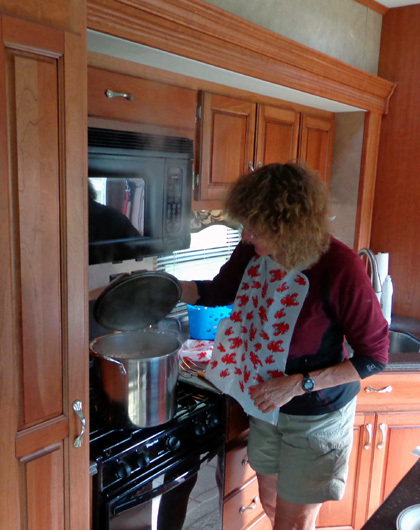 Cost of the lobsters was $21 -- no extra for the instructions or equipment loan! This is an informal place without a lot of people or rules. We like that. 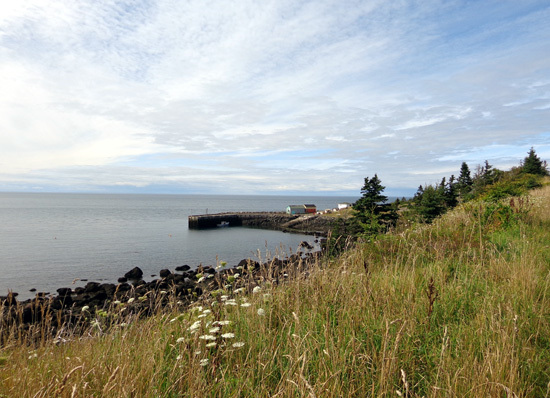 This part of Fundy Bay has lower tides than farther north at Minas Basin or Hopewell Rocks but it's still significant at about 22 feet up and down every six hours. 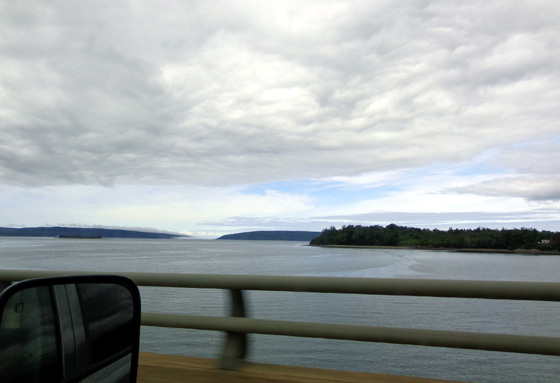 It was about halfway between low and high tides when we were in the cove and at the ferry in the East Ferry community. We talked to the folks who run the Petit Passage Whale Watch boats at East Ferry but didn't make a reservation for a cruise right then. The campground staff and the young couple from Ottawa recommended a different company, which we checked out the next day. 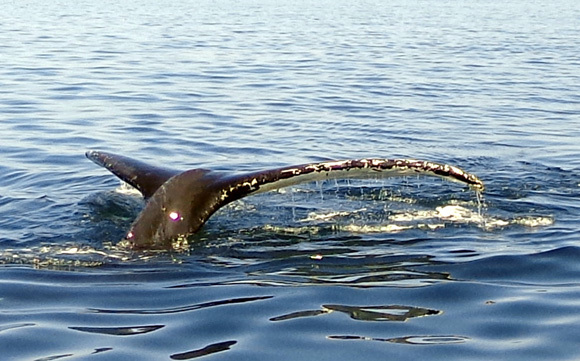 Above and below: Here's a preview of pictures from our whale-watching cruise. 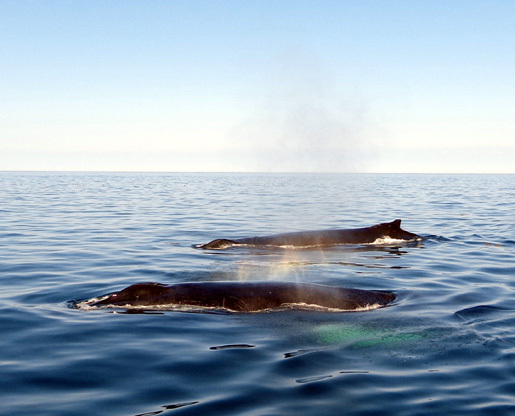 From all we heard, there are lots of whales near the coast this summer and it's easy to see them up close from the boats. Since we didn't get to see any whales at close range on our cruise from Seward in Alaska two years ago, we will go out on one of the tours here this weekend. So, yeah, we're happy with our decision to stay farther down on Digby Neck. 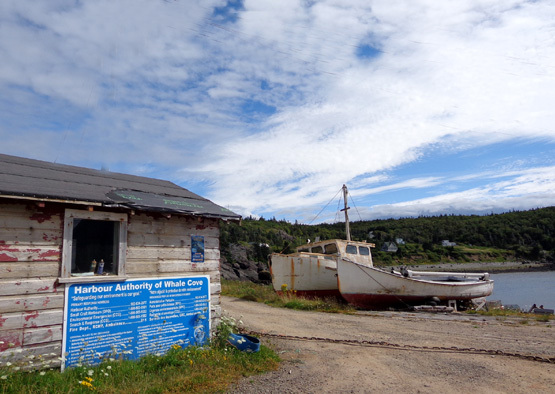 We'll find more things that interest us here than we would have in Digby. Travelers always gotta stay flexible and open to possibilities!